Additional offer Statuses can be created depending on need and preference. 1. From the Admin tab, click on the Statuses sub tab at left. A series of tabs will appear at the top of the screen to the right, as shown below. Click the Offer tab. 3. Select the desired weight of the item from the Weight drop-down box. The status weight controls the sorting order of each status in menus where they can be selected in the Properties > Offers tab. The lower the number, the higher the item will appear on the list. 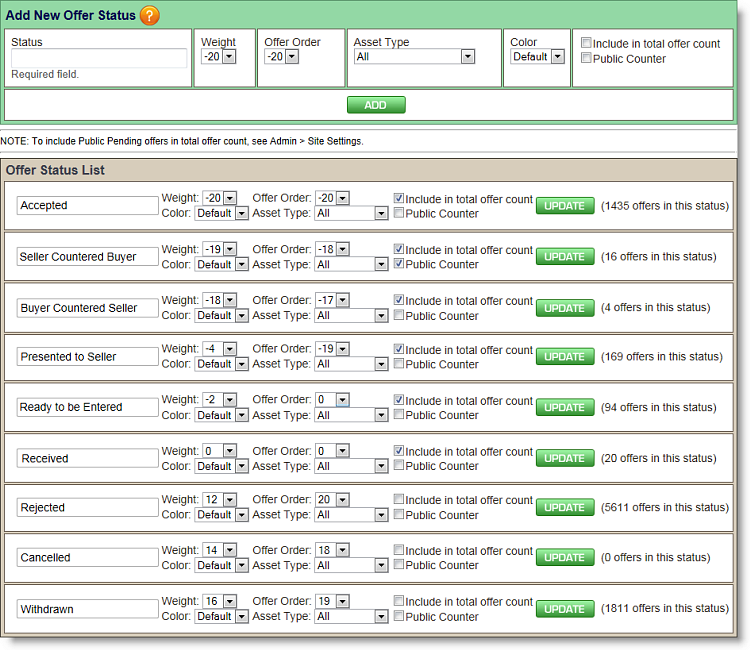 Before you set a weight, review the current statuses beneath the Offer Status List bar. These are the current offer statuses and are listed in order by weight. 4. Set the desired offer order using the Offer Order drop-down box. This option controls the order in which offers will appear in the offer list for a property. The lower the number, the higher it will appear on the list. The only exception to this is for Public Pending offers, which are those that were submitted via the public website. These will always appear at the top. This cannot be changed. 6. If the status is specific to a particular type of asset, select the appropriate type from the Asset Type field. 7. The Include in total offer count field was designed to give you the ability to control which statuses an offer has to be in to be included in the offer count for a property. Place a check mark next to the status if it should be included in the count, and leave it unchecked if you wish to exclude it. 8. If you enable the Public Counter box, agents will see a counter offer option appear on their Public Offer Follow up page when an offer is placed in this status. They can submit a counter offer directly from that page. See Counter Offers on Public Site for more information. 9. Click the green Add button. The new status will be added to the Offer Status List. Directly above the Offer Status List bar you will notice a statement that says, NOTE: To include Public Pending offers in total offer count, see Admin > Site Settings. This statement means that you have the ability to choose whether or not an offer submitted via the public website that has not yet been reviewed should be included in the offer count. If you wish to include public offers in the offer count, you will need to select the Include Public Pending Offers in Offer count check box in Admin > Site Settings > Public Offers (see Public Offers). You can change the defaults on an existing status at any time by making your changes and then clicking the green Update button at right of the status details.